I was famished when I got home tonight. 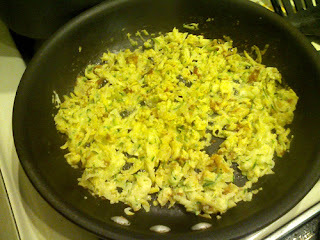 I turned to breakfast food: potato pancakes but used summer squash instead. 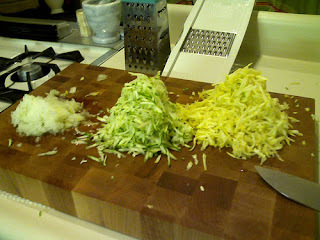 Grate yellow squash, zucchini and medium onion. Toss in a bowl with 2 eggs, a dash of ground cumin and dry mustard. (You could add a little flour, too.) Mix well. On a hot griddle or non-stick skillet, put a thin layer of the mixture in the pan. Keeping the heat medium-high, watch the edges for the egg to cook. Flip sections over as they begin to brown. Saute, letting the onion juices evaporate. Empty the pan when that batch is to the browness or doneness you want. Add a new batch and repeat. Top with fresh, diced tomato. Brilliant idea. I know, I’ve been doing something like it for some time now (that great minds saying, clearly, was acurate!). So far, my favorite finds are kale and squash blossoms.